A 96-year-old Martinez man and decorated World War II veteran yearns to return to France where he survived the horrors of D-Day 75 years ago, but when his son asked the Army to sponsor a trip, they found out he wasn't eligible because there was no record of his exemplary military service. But thanks to some help from his friends and a GoFundMe page, Jake Larson may see his dream come true after all. Kris Sanchez reports. 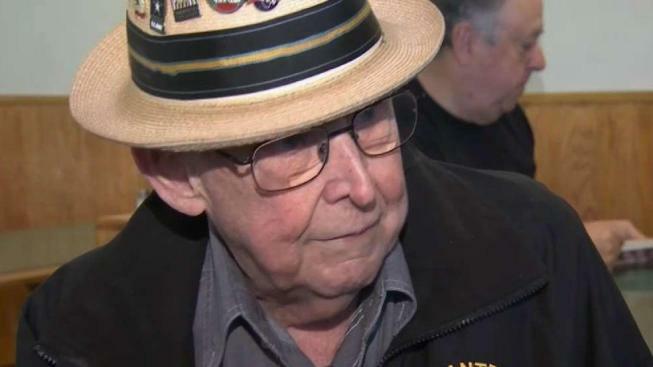 A 96-year-old Martinez man and decorated World War II veteran yearns to return to France where he survived the horrors of D-Day 75 years ago, but when his son asked the Army to sponsor a trip, they found out he wasn't eligible because there was no record of his exemplary military service. But thanks to some help from his friends and a GoFundMe page, Jake Larson may see his dream come true after all. While the Army sponsors trips for veterans to travel to their battlefields, Larson isn't eligible because his military records were destroyed in a Kentucky Army base fire in the 1970s. Larson, the only living survivor from his unit that stormed Omaha Beach in Normandy, was going to just let his dream vanish when he found out he couldn't get sponsored to go to France this summer. His friends won't let that happen. They have gone to battle for him and have been mobilizing to get him to France for the 75th anniversary commemoration of D-Day coming up in June. "We're like, we're going to get a GoFundMe," Linda Linnell, a friend of Larson, explained. "He didn't even know what it was. And he joked around later, he said he got choked up, he said, 'I cannot believe people that don't even know me are donating to me.'" The GoFundMe for Larson had raised more than $5,200 as of Tuesday morning. Roughly 24 hours later, that amount had ballooned to more than $9,000. The outpouring of support from his friends and complete strangers has made Larson feel as if he's the luckiest man in the world. "I love 'em," Larson said. "You guys are all my family. I'm so proud of everyone. It chokes me up." Larson is a recipient of the Bronze Star and France's Legion of Honor, the most prestigious award in France, all after lying about his age at 15 so he could join the National Guard and serve his country. "He's a staple up here," Linnell said. "Everybody loves him."